I walked along the beach with heavy eyes as the sun started to peek over the horizon, creating an illusion with its rays as it made the once blue water a mixture of pink and orange. I slowly made my way onto the cold morning shores and immediately began to shiver. I trudged on a little further until the water was waist-deep. I closed my eyes, dunked my head beneath the surface, and began to put on my mask, snorkel, and fins, just as I have done many times before. Julie looked over and asked the group if we were ready to go. I braced myself for the long swim ahead as I gave the “okay” and we began to head out. As we swam further out I told myself, “Don’t get your hopes up, we can never know for sure.” I told myself that this day was going to be like any other day that I had gone snorkeling. However, little did I know that today would be the day that I would finally have the honor of swimming with one of the ocean’s gentle giants. We swam for what seemed to be forever. While everyone else swam ahead of me, I trailed behind soaking in every little detail of the scene before me: the fish that would poke their heads out from the coral, the way the light broke through the surface, and the stillness of the water – so peaceful and ominous at the same time. As we swam out further and further, I saw a turtle from the corner of my eye and decide to stray away from the group for just a bit to follow it. Suddenly, the only thing I heard was “AHHH! !” and I immediately swam over to my friend Leilani – the source of this excited scream. She immediately pointed in front of her while flailing her arms, as if she was trying to dance underwater. I tried my hardest to focus on what she was pointing at but couldn’t seem to see anything but a giant, black figure. I waited for a while until the figure finally came close enough for me to admire its magnitude and beauty. Manta alfredi is the scientific name given to this creature, but to me it was an alien being that terrified yet captivated me. 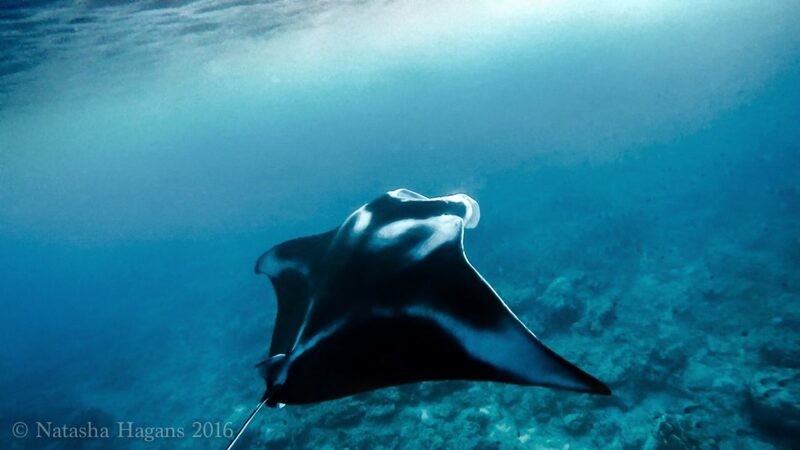 I watched as it dove down below us, followed by what seemed like a train of about four other mantas. 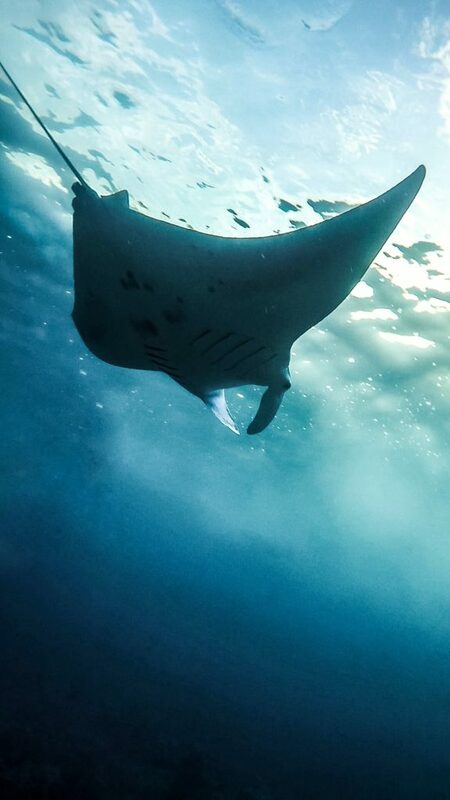 I couldn’t believe it, I was actually swimming with manta rays. After floating around with my jaw dropped open and my eyes wide, I was finally able to collect myself and tried to remember what we came out here to do: to get ID’s. I put my head back in the water and tried to search for the nearest manta ray. After spotting one I dove down to try and take a picture of their belly pattern, but to my surprise the manta was far gone by the time I flipped around to take the picture. I began to realize that this was going to be a lot harder than I thought. I tried my best to get an ID picture, swimming after the mantas and diving down several times. Julie, who probably saw the exhaustion on my face, reminded me that I shouldn’t be chasing the manta rays but that I should wait for them to come to me. Listening to her advice I stayed put and waited for a manta to come my way, until one finally did. I waited for it to get near, took a breath, and dove down, finally getting the ID shot I had been trying so hard to get. It was a very strange feeling swimming underneath these giant creatures, a feeling that I now search for every time I step foot into the ocean. If someone were to ask me a year ago what I would see myself doing today, I probably would have never said that I would be out in the water almost every weekend, swimming with turtles, sharks, and manta rays. Micronesian Conservation Coalition has given me the opportunity to experience my island in a very different way; one in which I get to understand and learn more about our island environment while being able to interact with the creatures that inhabit it. My experience with manta rays is one that I will never forget, and it helps to remind me why I decided to join this organization – to not only learn about marine life, but to spread awareness to others in hopes that they would want to protect these creatures too. I would have been in trouble for touching. I know how much work went into the successful production of each of these pieces. COTOGATULANIRNS on SUCCESS in their making and on the expression of your vision in your art! YEAH!